The majority of the known Ly49 family members have been isolated from either C57BL/6 (B6) or BALB/c mice. Interestingly, the anti-Ly49 Ab reactivities observed in 129/J mice are different from those of B6 mice. Furthermore, immunoprecipitation of 129/J NK cell lysates with YE1/32 and YE1/48, Abs specific for the inhibitory Ly49A in B6, resulted in detection of the activation-associated DAP12 molecule. These results indicated a need for a more detailed study of this strain. Therefore, a cloning strategy was devised to isolate Ly49 cDNAs from 129/J mice. An immunoreceptor tyrosine-based inhibitory motif-containing, Ly49D-related clone was discovered that we have named Ly49O, and one immunoreceptor tyrosine-based inhibitory motif-lacking, Ly49A-related clone was discovered that we have named Ly49P. No anti-Ly49 mAb reacted with Ly49O, whereas the molecule encoded by the Ly49P cDNA was found to react with YE1/32 and YE1/48. Ly49P was found to associate with mouse DAP12, and Ab-mediated cross-linking of Ly49P resulted in mouse DAP12 phosphorylation and Ca2+ mobilization, indicating that Ly49P is a competent activation receptor. Ly49P, therefore, represents a novel member of the Ly49 activating receptor subfamily. There are currently nine Ly49 genes, plus five additional potential candidates known from sequence fragments, that have been identified in the C57BL/6 (B6)5 mouse genome (1, 2, 3). The functional role of several family members has been studied with specific mAbs. Ly49A, C, G, and I have been shown to inhibit NK cell function in response to specific MHC class I ligands on target cells (4, 5, 6), whereas Ly49D has been shown to activate NK cell function (7). The inhibitory Ly49s contain an immunoreceptor tyrosine-based inhibitory motif (ITIM) in their cytoplasmic domains that becomes phosphorylated in response to receptor ligation, leading to recruitment of the SH2 domain-containing tyrosine phosphatase (SHP-1) phosphatase and attenuation of intracellular signaling (8, 9, 10). Ly49D and H require the association of a signaling molecule (DAP12) containing an immunoreceptor tyrosine-based activation motif to transmit activating signals (11, 12, 13, 14). 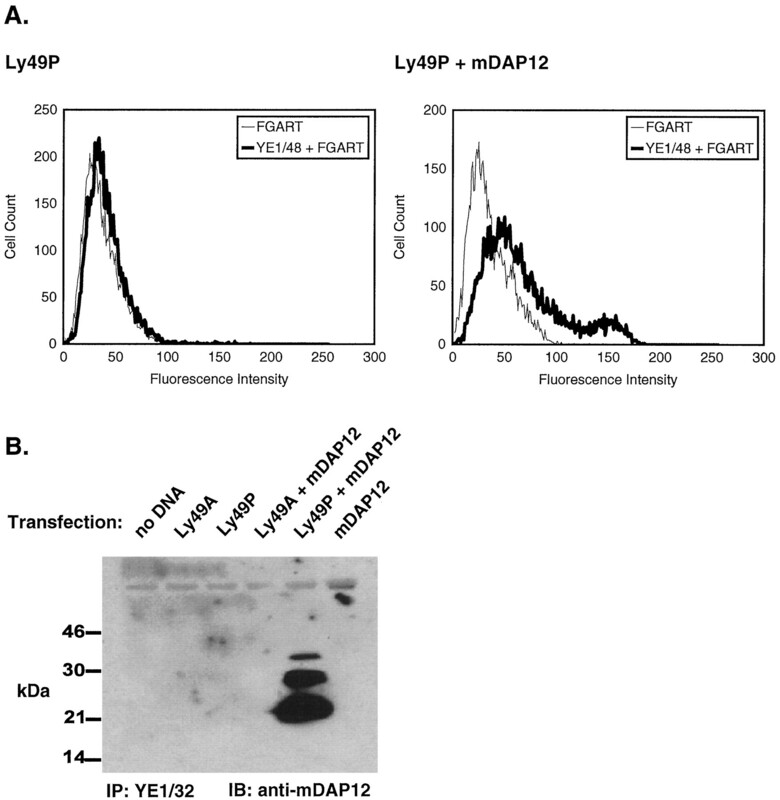 A transmembrane arginine residue in Ly49D is required for DAP12 association, and a similar charged residue is present in Ly49H. Three of the potential new genes (K, L, and N) found in the B6 genome are similar to either Ly49D or H in the intracellular domain (i.e., lacking an ITIM), suggesting that they may also represent activating Ly49s (3). However, whether these new Ly49s are functional, or even expressed, is unknown. Although the 129/J mouse strain is used extensively for gene mutation studies, only Ly49I has been characterized in this strain (15). We have found that there are interesting differences in the anti-Ly49 Ab reactivity to NK cells from non-B6-strains, including 129/J mice (16). For example, YE1/48 is an Ly49A-specific Ab in B6 mice, but it shows only weak reactivity in 129/J mice. In addition, the reactivities of 4E5 (Ly49D), 12A8 (Ly49A and D), and 4D11 (Ly49G2) to 129/J-derived NK cells are not identical with B6-derived NK cells. This suggests that either the Ly49 repertoires of various mouse strains are different or the currently available Ly49-specific Abs are strain-specific. To gain a better understanding of the Ly49 phenotype of 129/J mice, a PCR-based cloning approach was used to characterize 129/J-derived Ly49 cDNAs. In addition to typical Ly49G and I clones, clearly divergent activating Ly49A-related and inhibitory Ly49D-related clones were isolated. Due to the divergent nature of these new Ly49 molecules when compared with the known Ly49 family members, they were designated Ly49P and Ly49O, respectively. Ly49P was found to cross-react with the Ly49A-specific mAbs YE1/32 and YE1/48. With the use of YE1/48 mAb, Ly49P was found to share the functional characteristics of Ly49D and H. This included association with mouse DAP12 (mDAP12), which becomes phosphorylated upon Ly49P cross-linking. In addition, Ly49P cross-linking resulted in the ability to transduce a signal leading to intracellular Ca2+ mobilization. Therefore, Ly49P should be added to the list of known activating Ly49 receptors. The following mAbs were used: YE1/32 and YE1/48 (Ly49A; Ref. 17), 12A8 (Ly49A/D; Ref. 7), and 4E5 (Ly49D; Ref. 11). Biotinylated 4G10 Ab, which recognizes phosphotyrosine, was purchased from Upstate Biochemical (Lake Placid, NY). Rabbit anti-rat IgG was used as a cross-linking reagent (Capell Laboratories, Oxford, PA). Rabbit20 is an anti-serum prepared in this laboratory by injecting rabbits with an oligopeptide consisting of the 12 carboxy-terminal amino acids of mDAP12. DX5 (pan-NK cell) mAb was a kind gift of Lewis Lanier (DNAx, Palo Alto, CA). NK cells from 129/J mice were enriched from spleens of 12- to 16-wk-old animals by collecting nylon wool nonadherent cells and depleting T cells using mAbs to Ly-2.2 and CD4 and complement. Routinely, 75–80% of the resulting cells were DX5+. Mouse NK cells were cultured for 7–10 days in RPMI 1640 medium supplemented with 1000 cetus units/ml IL-2 (Hoffman-La Roche, Nutley, NJ), 10% FCS, nonessential amino acids, sodium pyruvate, HEPES, 2-ME, 2 mM l-glutamine, and 100 U/ml penicillin plus 100 μg/ml streptomycin. The human kidney epithelial cell line, 293, was propagated in DMEM containing 10% FBS, glutamine, and antibiotics. The recently described human fetal liver cell line CP (14), which is DAP12+, CD56+, CD16−, and CD3−, was maintained in RPMI 1640 medium containing 10% FBS, glutamine, and antibiotics. 129/J NK cell poly(A) mRNA was isolated using the Pharmacia (Uppsala, Sweden) mRNA purification kit. A total of 1 μg of mRNA was used to generate cDNA with the Superscript cDNA synthesis system (Life Technologies, Rockville, MD). 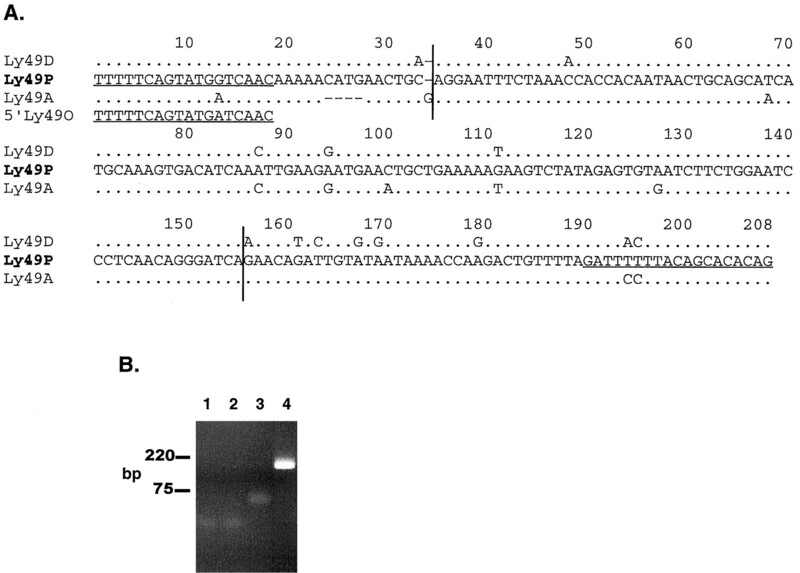 Degenerate Ly49 primers were used to amplify 1 μl of cDNA. The 5′ primers used were: 5′-TCATACATCGATCCCAMGATGAGTGAGC-3′ containing a ClaI site, or 5′-CAAGGGCCCTACTCCCGAGATGACTGAAC-3′ containing an ApaI site. The 3′ primers used were: 3′-CTSATTRACYTYCCGCGGAGWGTTAAAG-5′ or 3′-CTCATTGACTCTCCAGTGAGCCGCGGAGTGTTG-5′, both containing a SacII site. A total of 30 cycles of amplification were performed with Taq polymerase (Life Technologies) at temperatures of 94°C (denaturation), 55°C (annealing), and 73°C (extension) for 45 s at each step. The PCR products were cut with the appropriate restriction enzymes, gel purified, and cloned into pBluescript KS or the pEF expression vector (18). Clones were sequenced with specific primers using the Sequenase quick-denature kit (Amersham, Cleveland, OH). Identical Ly49O and P clones were isolated from three separate PCRs and sequenced. The accession numbers for Ly49P and Ly49O are AF146570 and AF146571, respectively. Ly49A cDNA was cloned into the pSE1 expression vector. Identification of mDAP12 cDNA has been described previously and is contained within the pCMV-Sport2 expression vector (19). Like Ly49P, Ly49D cDNA was cloned into the pEF expression vector. On the day before transfection, 3 × 105 293 cells were seeded in six-well plates in complete medium. The following day, 293 cells were transfected with 0.5 μg each of the indicated combinations of Ly49A, P, or mDAP12 expression constructs using FuGene 6 reagent (Boehringer Mannheim, Indianapolis, IN). Four million CP cells from a log phase culture were put in 0.4 ml of RPMI 1640 plus 10% FBS (no antibiotics) and electroporated with 20 μg of Ly49D or P cDNA-containing vector along with 20 μg of empty pEF as carrier DNA. Electroporation was conducted at 310 mV/960 μF using a Bio-Rad GenePulser (Hercules, CA). Both 293 and CP cells were used at 1 day posttransfection. Transiently transfected 293 cells or cultured mouse NK cells were harvested with 1 mM EDTA and stimulated with 0.1 mM pervanadate as described previously (20) for 15 min at 37°C or with specific Ab followed by an isotype-specific cross-linker for 2 min at 37°C. Cells were disrupted in lysis buffer (1.0% Triton X-100, 300 mM NaCl, 50 mM Tris, 2 mM EDTA, 0.4 mM sodium orthovanadate, plus protease inhibitors) and subsequently centrifuged at 15,000 rpm for 30 min at 4°C. 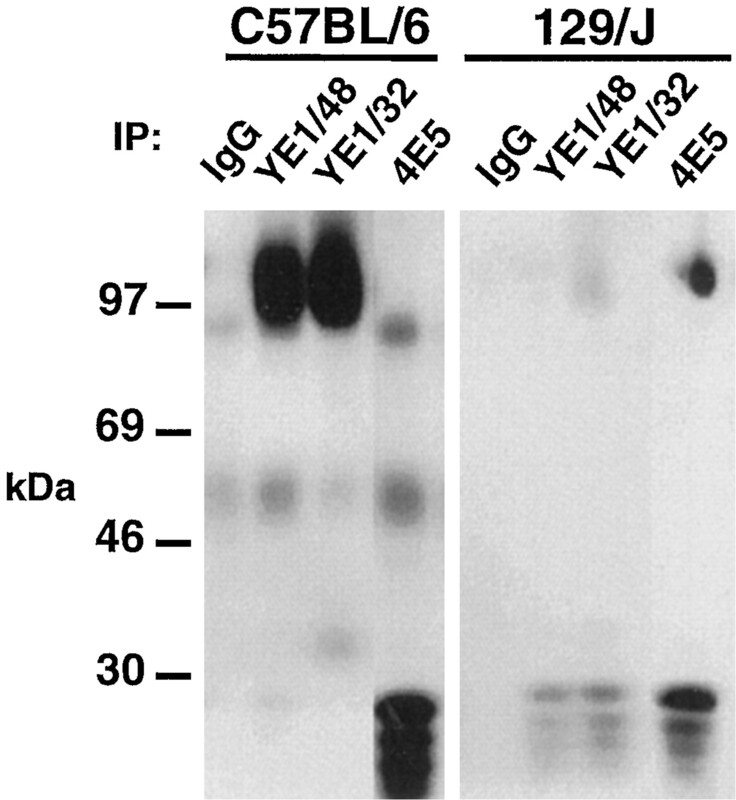 Lysates were immunoprecipitated for 3–4 h with specific mAb cross-linked to protein G-Agarose (Life Technologies). Beads were washed in wash buffer containing 0.2% Triton X-100, and proteins were eluted in nonreducing Laemmli buffer and separated by SDS-PAGE. Proteins were transferred to Immobilon-P (Millipore, Bedford, MA), and the blots were blocked with 5% BSA, 0.1% Tween 20 in PBS. Biotinylated 4G10 was used to detect phosphoproteins followed by streptavidin-HRP (Upstate Biochemical). Alternatively, Rabbit20 anti-sera was used to detect mDAP12 followed by donkey anti-rabbit IgG HRP (Amersham, Arlington Heights, IL). Blots were treated with a chemiluminescent reagent (Amersham) and subsequently exposed to BioMax ML film (Kodak, Rochester, NY). 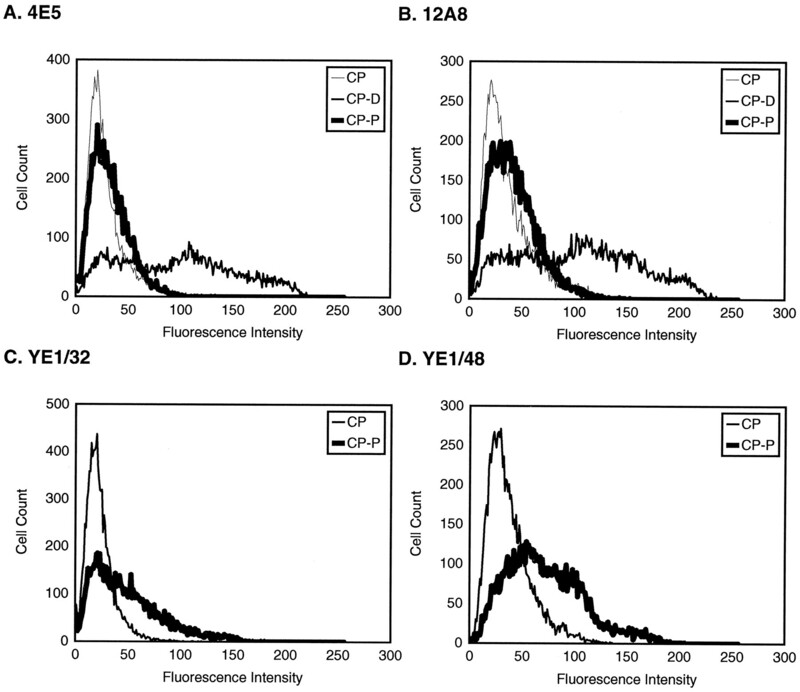 Analysis of the changes in intracellular Ca2+ concentration ([Ca2+]i) were conducted using a FACSort flow cytometer and the calcium-sensitive fluorochrome Fluo-3 (Molecular Probes, Eugene, OR). Briefly, cells (2 × 106/ml) were incubated at 25°C in Dulbecco’s PBS without Ca2+ or Mg2+ containing 15 μg/ml Fluo-3. After 30 min, cells were washed in Dulbecco’s PBS and maintained at room temperature in the dark until analysis. The [Ca2+]i was monitored with the loaded cells (40 μl) diluted to 500 μl with DPBS containing Ca2+ and Mg2+, glucose, and sodium pyruvate. The cells were kept at 37°C during analysis. Baseline data were collected for 20–30 s, after which the cells were stimulated with primary (10 μg/ml) mAb followed 20–30 s later by rabbit anti-rat Ab (10 μg/ml). Data were analyzed using MultiTime Kinetic Experiment Analysis Software (Phoenix Flow Systems, San Diego, CA) and were expressed as the percentage of responding cells relative to unstimulated baseline measurements. YE1/48 stains ∼20% of NK cells from B6 mice (6). However, YE1/48 staining of 129/J NK cells is very weak (16), suggesting that the Ly49A in this strain is expressed at very low levels or that YE1/48 cannot bind to the 129/J Ly49A-like receptor. Further insight into the nature of Ly49 molecules can be gained from the phosphotyrosine-staining pattern of proteins immunoprecipitated with specific anti-Ly49 mAb from pervanadate-stimulated NK cells (9). Therefore, B6 and 129/J NK cells were stimulated with sodium pervanadate and immunoprecipitated with Ly49-specific mAb followed by immunoblotting with anti-phosphotyrosine Ab. In this experiment, inhibitory Ly49s should appear as phosphotyrosine-containing bands at ∼97 kDa, whereas only a tyrosine-phosphorylated “ladder” of mDAP12 (between 20 and 30 kDa) should appear when an activating Ly49 is immunoprecipitated. This ladder is, perhaps, the result of variable phosphorylation of the four tyrosines contained within the mDAP12 homodimer. As expected, immunoprecipitation of B6 NK cells with YE1/32 or YE1/48 detected only the phosphorylated forms of Ly49A, whereas immunoprecipitation with 4E5 detected Ly49D-associated mDAP12 ladder (Fig. 1⇓). Like B6 NK cells, immunoprecipitation of 129/J NK cells with 4E5 showed mDAP12 association. In addition, a phospho-Ly49 band appeared in the 4E5 immunoprecipitation. These data suggest that 129/J mice possess both activating and inhibitory Ly49D-like receptors. Surprisingly, immunoprecipitation of 129/J NK cells with YE1/48 or YE1/32 resulted in the detection of tyrosine-phosphorylated proteins that look similar to mDAP12 but not in any detectable phospho-Ly49 (Fig. 1⇓). These results provide support for the existence of an ITIM-deficient, mDAP12-associating Ly49A homologue in 129/J mice. mDAP12 associates with an Ly49A-related receptor in 129/J mice. NK cells from B6 (left) and 129/J (right) mice expanded with IL-2 for 7–10 days were washed and stimulated with pervanadate. Cells were lysed and immunoprecipitated with the indicated anti-Ly49 Abs. YE1/32 and YE1/48 bind to Ly49A and 4E5 binds to Ly49D in B6 mice. The immune complexes were run on a nonreducing 10% gel, transferred, and blotted with 4G10 (anti-phosphotyrosine Ab). A representative blot of two experiments is shown. The atypical reactivities of the various anti-Ly49 Abs in 129/J NK cells compared with B6 NK cells (16), along with the different tyrosine phosphorylation patterns observed after immunoprecipitation with YE1/32 and YE1/48, indicated that the Ly49A-related gene in this strain of mice is different from B6. To determine which Ly49 genes are present in 129/J mice, a cloning strategy was devised. Comparison of the cDNA sequences surrounding the translation initiation and termination sites of the known Ly49 genes led to the design of an oligonucleotide primer pair theoretically capable of amplifying all known Ly49s with the exception of Ly49D and B. A second primer pair was designed to amplify Ly49D-related cDNAs. No attempt was made to amplify Ly49B-related molecules in this study because no anti-Ly49B Ab is currently available. PCR products were cut with primer-specific restriction enzymes, cloned into pBluescript KS+, and sequenced. The majority of the cDNAs identified with these primer sets were of the 129/J homologue of Ly49G that possessed 99% amino acid identity with B6 (data not shown). The multiple Ly49G clones isolated from 129/J mice included both Ly49G1 and Ly49G2 representatives similar to those reported previously (1). Several clones of Ly49I were isolated that matched the previously reported sequence of the 129/Sv-derived clone of Held et al. (15). Several clones related to B6 Ly49A and D were isolated; however, the intracellular domains appeared to be different from their B6 counterparts. The 129/J clone with a carbohydrate recognition domain (CRD) most closely related to the B6 Ly49D (97% amino acid identity) had stalk, transmembrane, and intracellular domains that were of the inhibitory type (i.e., contained an ITIM) and were most similar to the B6 Ly49A (97% amino acid identity). Because this clone is significantly different from all known Ly49s, we have named it Ly49O (Fig. 2⇓A). The overall homologies of Ly49O to A and D were 93% and 82%, respectively. Conversely, the 129/J clone with a CRD most closely related to the B6 Ly49A (96% amino acid identity) had transmembrane and intracellular domains that were of the activating type (i.e., lacked an ITIM and contained an arginine in the transmembrane domain) and were most similar to the B6 Ly49D (84% amino acid identity). Because this clone is also significantly different from all known Ly49s, we have named it Ly49P (Fig. 2⇓B). The overall homologies of Ly49P to A and D were 83% and 85%, respectively. It should be noted that minor sequence differences may exist in the ends of these clones as they are primer-derived. Proposed amino acid sequence of Ly49O and P. The amino acid sequences of the 0.8-kb cDNAs encoding Ly49O (A) and Ly49P (B) compared with Ly49A and D are shown. Dots indicate regions of identity with the novel Ly49. Dashes represent missing amino acids. The arginine in the transmembrane region and the ITIM sequence in the intracellular region (indicative of activating and inhibitory Ly49s, respectively) are shown in bold. cDNAs were isolated from at least two separate cloning experiments to eliminate PCR error. These sequences can be found under GenBank accession numbers AF146571 (Ly49O) and AF146570 (Ly49P). Examination of the amino acid homologies of these new Ly49s suggests that the Ly49A and D genes have recombined to produce Ly49O and P. Because several independent Ly49O and P cDNAs were isolated from three separate PCR experiments, it is unlikely that these molecules resulted from recombination in the PCR. Additional experiments were conducted to provide further proof that the Ly49P gene exists in the 129/J genome. Because the apparent site of recombination between Ly49A and D is within exon 4 of Ly49P, primers were chosen at either end of this exon that were specific for Ly49P. Fig. 3⇓A shows the sequence of exon 4 of Ly49P with the primer sequences underlined. The first 33 nucleotides of this exon are clearly more homologous to Ly49D, whereas the last 52 nucleotides are more related to Ly49A. The middle portion of exon 4 is closely related to both Ly49A and D, and recombination is likely to have occurred in the interval between nucleotide 33 and 155 as denoted by the vertical lines in Fig. 3⇓A. Fig. 3⇓B shows the result of amplifying 129/J genomic DNA with Ly49P or Ly49A 5′/Ly49P 3′ primer sets. If Ly49P was the result of recombination between Ly49A and D in the PCR, then amplification using a 5′ Ly49A/O primer with a 3′ Ly49P primer should amplify a 129/J exon 4 that is entirely homologous to Ly49A. However, only the 5′ Ly49P/3′ Ly49P primer set worked, indicating that an Ly49P gene does in fact exist. The sequence of the amplified DNA obtained with the Ly49P primer set corresponded exactly to the Ly49P sequence shown in Fig. 3⇓A. 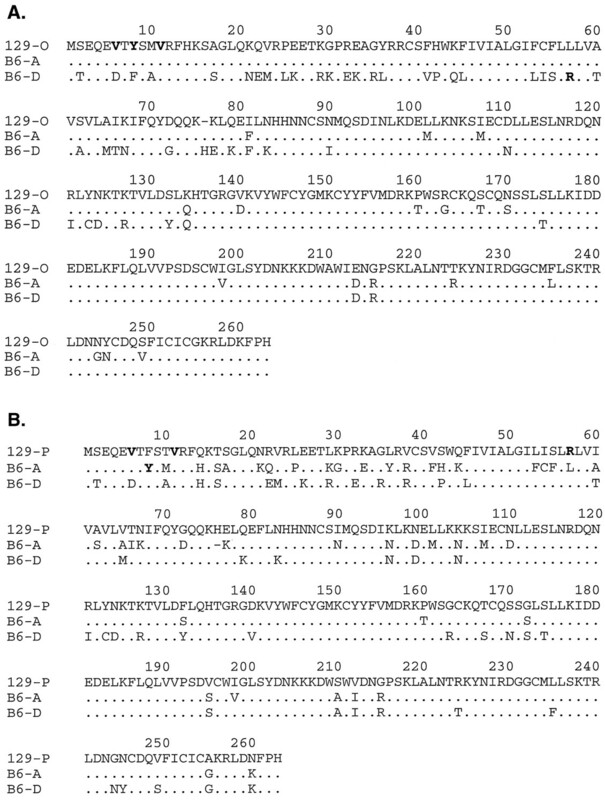 Characterization of Ly49P exon 4. A, The nucleotide sequence of Ly49P exon 4 is shown. The sequence was determined from PCR products generated from 129/J cDNA as well as 129/J genomic DNA. The sequences of the Ly49P 5′ and 3′ primers used to amplify exon 4 are underlined, as well as the sequence of the 5′ Ly49O/A primer used to test for PCR recombination between Ly49A and D. The vertical lines separate Ly49P exon 4 into three distinct regions based on homology to Ly49A and D. The 5′ region is most homologous to Ly49D, the central region is similar to both Ly49A and D, and the 3′ region is more related to Ly49A. B, Amplification of exon 4 of the Ly49P gene. A total of 10 ng of 129/J genomic DNA was amplified for 35 cycles with an annealing temperature of 58°C using the Ly49A/O 5′/Ly49P 3′ primer set (lanes 1 and 2) or the Ly49P 5′/Ly49P 3′ primer set (lanes 3 and 4). The size in base pairs of DNA markers is shown on the left. The cloning results described above predicted the existence of activating Ly49A-related and inhibitory Ly49D-related molecules on the surface of 129/J NK cells. To determine whether Ly49O was the molecule recognized by 4E5 and whether Ly49P was the molecule recognized by YE1/48 and YE1/32 on 129/J NK cells, the reactivity of these clones to various anti-Ly49 mAbs was determined. Ly49O and P were cloned into mammalian expression vectors and transfected into the human fetal-liver derived, DAP12+ cell line CP; next, FACS analysis was performed with a panel of anti-Ly49 Abs (Fig. 4⇓). Untransfected CP cells showed little to no reactivity with all anti-Ly49 mAbs tested. As shown in Fig. 4⇓D, YE1/48 had the strongest reactivity to Ly49P followed by YE1/32 (Fig. 4⇓C). Both of these mAbs bind to Ly49A in B6 mice. The Ly49D-specific mAb 4E5 and the Ly49A/D cross-reactive mAb 12A8 did not show reactivity to Ly49P above that of untransfected CP cells (Fig. 4⇓, A and B, respectively). As a control, 4E5 and 12A8 mAbs were shown to react very strongly with Ly49D-transfected CP cells (Fig. 4⇓, A and B). Because the CRD of the Ly49O molecule was highly related to Ly49D, it was expected that it would account for the putative inhibitory Ly49 immunoprecipitated by 4E5 (Fig. 1⇑). However, similar FACS experiments with Ly49O-transfected cells showed no positive staining with any of the anti-Ly49 Abs (data not shown). Reactivity of Ly49P to a panel of anti-Ly49 mAbs. CP cells (A), CP cells transfected with Ly49D (B), or CP cells transfected with Ly49P (C) were stained with the indicated mAb followed by a FITC-labeled secondary goat anti-rat serum. YE1/32 and YE1/48 are specific for Ly49A, 4E5 is specific for Ly49D, and 12A8 is cross-reactive for Ly49A and D in B6 mice. Ly49D and Ly49H both require association with mDAP12 for surface expression (13). Moreover, it has been shown that the arginine residue in Ly49D is required for DAP12 association (11). Because Ly49P contains an arginine residue in the transmembrane region, it was expected that Ly49P would also associate with mDAP12. To confirm this hypothesis, 293 cells were transfected with Ly49P alone or in combination with mDAP12. Positive staining with YE1/48 was only seen in those cells expressing both Ly49P and mDAP12 (Fig. 5⇓A). This suggests that like Ly49D and H, Ly49P expression is stabilized by mDAP12. To directly show a physical interaction between Ly49P and mDAP12, 293 cells were transfected with Ly49A or P, with or without mDAP12, immunoprecipitated with YE1/32, separated by SDS-PAGE under nonreducing conditions, and immunoblotted with anti-mDAP12 antiserum. As shown in Fig. 5⇓B, mDAP12 could only be detected in Ly49P/mDAP12-transfected 293 cells; it could not be detected in cells transfected with Ly49A/mDAP12 or mDAP12 alone. Therefore, it appears that in addition to Ly49D and H, Ly49P also forms complexes with mDAP12. The lack of detectable mDAP12 in Ly49A/mDAP12- and mDAP12-transfected 293 cells shows that YE1/32 does not cross-react with mDAP12 and that Ly49A does not associate with mDAP12. 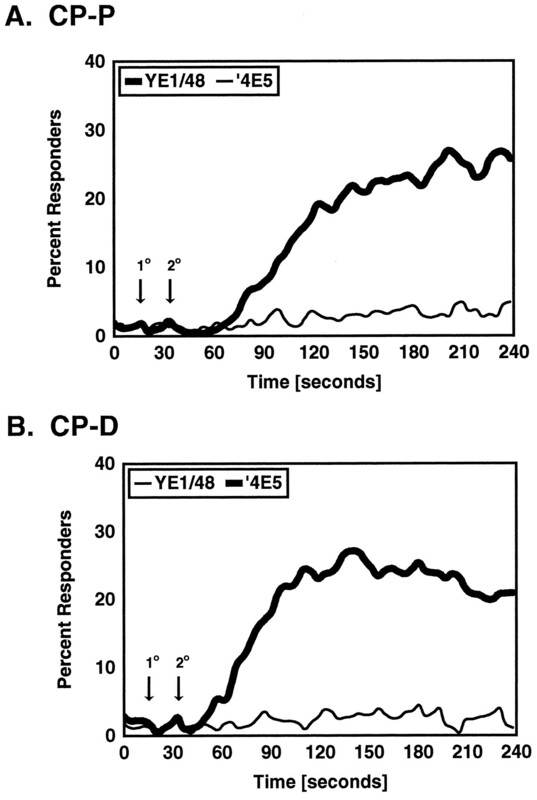 In a similar experiment performed with the human CP cell line, Ly49P was found to associate with human DAP12 (data not shown). mDAP12 forms a complex with Ly49P. A, 293 cells were transfected with Ly49P alone or in combination with mDAP12 and stained with YE1/48 followed by a FITC-labeled secondary FITC-labeled goat anti-rat Ab. B, 293 cells were transfected with the indicated cDNAs in expression vectors using FuGene 6 transfection reagent. Cell lysates were immunoprecipitated with YE1/32. Immune complexes were run under nonreducing conditions, transferred, and blotted with Rabbit20, an anti-mDAP12 antiserum. The cross-linking of Ly49H by Ab or of Ly49D by both Ab and target cell H-2Dd leads to mDAP12 phosphorylation (Refs. 11 and 14 ; L. H. Mason and J. R. Ortaldo, manuscript in preparation). Stimulation of the Ly49D/mDAP12 complex results in signal transduction involving the phosphorylation of several cellular substrates (19). To determine whether Ly49P could also induce protein tyrosine phosphorylation upon stimulation, the phosphorylation state of Ly49P-associated mDAP12 cross-linking was assessed after cross-linking. 293 cells were transfected with Ly49P/mDAP12 or Ly49D/mDAP12 as a positive control, stimulated by cross-linking with specific mAb, immunoprecipitated, and subjected to SDS-PAGE, followed by immunoblotting with anti-phosphotyrosine or anti-mDAP12 antisera. Cross-linking of Ly49P by YE1/32 for 3 min resulted in the detection of the phosphorylated mDAP12 homodimer ladder (Fig. 6⇓). Likewise, cross-linking of Ly49D by 4E5 also resulted in mDAP12 phosphorylation. A similar experiment performed in CP cells showed that cross-linking of Ly49P resulted in human DAP12 phosphorylation (data not shown). 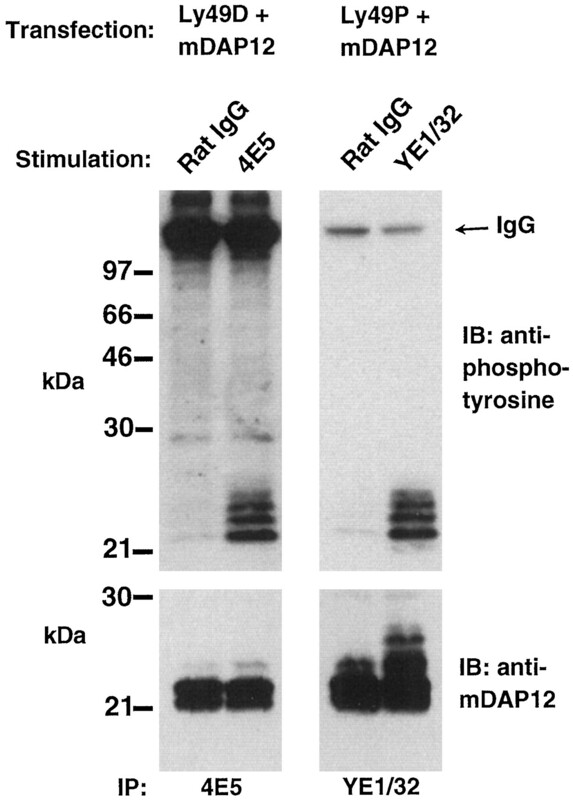 The bands seen in the 150-kDa range in both the rat IgG and 4E5/YE1/48 stimulations are the Abs used in the immunoprecipitation cross-reacting with the anti-phosphotyrosine mAb. These results suggest that Ly49P has early signal transduction characteristics similar to the other activating Ly49 receptors and potentially shares downstream signaling events. Ab-mediated cross-linking of Ly49P results in mDAP12 phosphorylation. 293 cells were transfected with the indicated cDNAs in expression vectors using FuGene 6 transfection reagent. Cells were treated with specific mAbs or irrelevant rat IgG followed by a 2-min incubation with an isotype-specific secondary Ab at 37°C. Cell lysates were immunoprecipitated with 4E5 or YE1/32, which are specific for Ly49D and P, respectively. Immune complexes were run under nonreducing conditions, transferred, and blotted with 4G10 (anti-phosphotyrosine) or Rabbit20, an anti-mDAP12 antiserum. Activating receptors such as Ly49D and H have been shown to induce intracellular mobilization of Ca2+ in cells upon Ab-mediated cross-linking (14, 19). To determine whether Ly49P also possesses this ability, CP cells were transfected with Ly49P or D, loaded with a dye that fluoresces in the presence of Ca2+, and subsequently cross-linked with specific mAb and isotype-specific secondary Ab. As shown in Fig. 7⇓A, the cross-linking of Ly49P-transfected CP cells with YE1/48, but not 4E5, results in a rise of cytoplasmic Ca2+ in a significant percentage of cells. Likewise, Ly49D-transfected CP cells are shown to mobilize Ca2+ when cross-linked with 4E5, but not YE1/48 (Fig. 7⇓B). It was also found that YE1/32 induced a similar Ca2+ mobilization in Ly49P-transfected CP cells, whereas 12A8 did not (data not shown). These results show that Ly49P responds to cross-linking with similar biochemical signaling as demonstrated with Ly49D and H.
Ly49P-induced Ca2+ mobilization. CP cells transfected with Ly49P (A) or Ly49D (B) were loaded with the Ca2+-sensitive dye Fluo-3 as described previously and subsequently stimulated with the indicated primary mAb (10 μg/ml) at the first arrow. After 15 s (second arrow), the Abs were cross-linked using rabbit anti-rat Ig (10 μg/ml). Intracellular Ca2+ was monitored using a flow cytometer and is expressed as the percentage of cells responding to the stimulus over time. This study reports the discovery of two new Ly49 molecules from 129/J mice. The cDNA sequences suggested that one is of the inhibitory class (Ly49O), whereas the other is an activating receptor (Ly49P). Surprisingly, the extracellular domains of these new Ly49s are most closely related to members of the functionally opposite subfamily in B6 mice. The extracellular region of Ly49O is most closely related to Ly49D, and the extracellular region of Ly49P most closely matches that of Ly49A. Similarly, two Ly49A-specific Abs, YE1/32 and YE1/48 were found to bind to Ly49P. Unfortunately, no Ab was found to bind to Ly49O. Although YE1/48 strongly stains a distinct subpopulation of NK1.1+ cells from B6 mice, it appears that 129/J NK cells are only weakly reactive with YE1/48 (16). The weak staining of 129/J NK cells with YE1/48 suggests that the receptor recognized is actually Ly49P and not Ly49A. The availability of Ly49P-binding mAbs allowed the functional characterization of Ly49P. Like the other members of the activating Ly49 subfamily, Ly49D and Ly49H, Ly49P was found to associate with mDAP12. Furthermore, cross-linking of Ly49P by Ab resulted in mDAP12 phosphorylation and Ca2+ mobilization signals. Therefore, it would seem that along with Ly49D and H, Ly49P should be included in the activating subfamily of Ly49 molecules. YE1/32 and YE1/48 immunoprecipitation of pervanadate-stimulated 129/J NK cells reveals a mDAP12-associated molecule (Fig. 1⇑). The levels of phospho-mDAP12 are lower in 129/J NK cells immunoprecipitated with YE1/32 and YE1/48 than 4E5. This is in agreement with the low surface reactivity of YE1/48 for 129/J NK cells (16) and collectively suggests that Ly49P is expressed at lower levels than Ly49D on 129/J NK cells. Alternatively, YE1/48 may bind poorly to Ly49P and the actual surface expression may be understated. It also remains to be determined whether Ly49P is the only molecule being recognized by YE1/48 in this strain of mice. In contrast to B6, the 129/J Ly49 with a CRD most closely related to Ly49A is an activating receptor. An inhibitory receptor, Ly49O, which is closely related to Ly49D, is also present in these mice. The MHC class I background of 129/J mice is H-2b like that of B6 mice. Because Ly49A and D have both been shown to recognize H-2Dd (4, 21), there may be no functional significance to the switch of the signaling domains of Ly49A and D in the 129/J mouse strain. However, there may be other undescribed ligands that have selected for the altered signaling properties of these two receptors in 129/J mice that are not found in B6 mice. The Ly49 expression pattern of an F1 hybrid between 129/J and B6 mice would shed light on this question. It should also be noted that the cross-reactivity of YE1/48 for both Ly49A and Ly49P does not necessarily imply the same MHC-ligand specificity. Interestingly, 129/J mice appear to have at least two different activating Ly49 proteins. Immunoprecipitation with 4E5 in 129/J mice also detected a putative activating Ly49D molecule (Fig. 1⇑). As of yet, no Ly49H-like molecule has been cloned in 129/J mice. It is possible that Ly49P is simply the 129/J allele of an already characterized Ly49. However, we think this is unlikely due to the large number of overall differences with any of the known Ly49 amino acid sequences. It also seems unlikely that Ly49P is a result of a recent duplication/recombination event specific to the 129/J strain, as the period of genetic isolation of the inbred mouse strains has been evolutionarily insignificant. It is more probable that the Ly49P gene is simply silent, or missing altogether, in certain strains of mice such as B6. The former possibility is supported by the recent characterization of five additional Ly49 genes in B6 mice (3). Although it has only been partially characterized, the intracellular domain of Ly49L is more closely related to Ly49P than either Ly49A or D. The fact that CBA/J mice also appear to have an activating Ly49A-like molecule (as shown by immunoprecipitation studies identical with those done in Fig. 1⇑, data not shown) lends support for the theory that Ly49P is, for whatever reason, silenced in B6 mice. Therefore, this would in turn suggest that the Ly49Agene is silent or missing in 129/J and CBA/J mice. The issue of whether these genes are turned off or completely missing would best be answered by mapping of the Ly49 gene cluster in the 129/J genome. Despite the speculation of the strain-specific expression of Ly49P, it is clear that at some point in murine evolution, in addition to multiple duplications, recombination between the different Ly49 genes has taken place. It should be noted that although it appears that Ly49P is the product of recombination between Ly49A and D, it is just as likely that Ly49A or D are the result of recombination between Ly49P and another Ly49, perhaps O. Because B6 mice are the predominant strain in which Ly49s have been studied, this has perhaps provided a limited representation of the Ly49 repertoire. Characterization of Ly49s in different mouse strains will provide a more complete view of the Ly49 molecules expressed on NK cells. ↵1 By acceptance of this article, the publisher or recipient acknowledges the right of the U.S. Government to retain a nonexclusive, royalty-free license in and to any copyright covering the article. The content of this publication does not necessarily reflect the views or policies of the Department of Health and Human Services, nor does mention of trade names, commercial products, or organizations imply endorsement by the U.S. Government. ↵2 This project has been funded in whole or in part with Federal funds from the National Cancer Institute, National Institutes of Health, under Contract No. NO1-CO-56000. ↵3 Animal care was provided in accordance with the procedures outlined in “A Guide for the Care and Use of Laboratory Animals” (National Institutes of Health Publication No. 86-23, 1985). ↵5 Abbreviations used in this paper: B6, C57BL/6; ITIM, immunoreceptor tyrosine-based inhibitory motif; mDAP12, mouse DAP12; [Ca2+]i, intracellular Ca2+ concentration; CRD, carbohydrate recognition domain. Ortaldo, J. R., A. T. Mason, R. Winkler-Pickett, A. Raziuddin, W. J. Murphy, and L. H. Mason. 1999. Ly-49 receptor expression and functional analysis in multiple mouse strains. J. Leukocyte Biol. In press.